Transcript from a conversation with Srin Madipalli, Product Manager, Airbnb, co-founder of Accomable. Listen on Soundcloud. 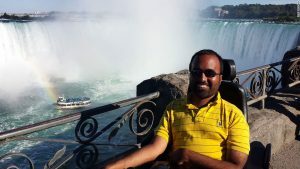 Suz: Our guest today is Srin Madipalli in his own words – which I copied from his Twitter bio – an entrepreneur, a coder, a commercial lawyer, a writer, an adventurer, a traveler and a MBA grad from Oxford University. Also a co-founder of Accomable, a website that connected disabled travellers to verified accessible properties. Accomable was acquired by Airbnb last fall. How are you doing Srin? Great having you on the show. Srin: Thank you very much for having me. Suz: What’s the weather like in San Francisco today? Srin: Sunny as always. It’s definitely different from London, just another sunny beautiful day with blue skies. Just another usual day. Suz: Now you live in San Francisco after the acquisition of your company but let’s start from the very beginning. Where did you grow up? Srin: I grew up in London. I first started out not too far from Stratford in East London and then later on I lived most centrally when I started work sort of in the Waterloo area. Suz: What would you say is your favorite London neighborhood? Srin: Gosh it’s difficult. As an East End boy, I suppose I will always have a certain special place in my heart for the East End. So places like around Stratford, East Town, Plastow area where I went to school in NAME. Having said that I do absolutely love the South Bank by near where I live in London, sort of in the Waterloo area. I’m slightly biased. My favorite neighborhoods being where I spent most time. Suz: What was it like growing up in London during your childhood? Srin: It’s a broad question in the sense, London is an intense and amazing city with lots going on and it is so incredibly diverse. My school life was an incredibly mixed environment so I went to a state school in Ilford in east London. And you have people who have loads of mixed abilities, loads of backgrounds from all over the world and probably one of the big things you take home from a very young age, it’s just how varied and diverse and mixed the world is and how people can come from so many different backgrounds. Suz: How are you finding the difference now between between London and San Francisco because you’ve been in San Francisco for a few months now? Srin: Yeah I mean it’s in some ways it’s very similar in the sense that you know it’s incredibly liberal cosmopolitan. People have very similar progressive outlooks on the world. So many people seem to work in tech and professional services and all of those usual industries. So you know, those are some overlapping similarities, the kind of being and working in the City and London, always within London’s tech hub. But then equally, it is very different in the sense that there are some major extremes of incomes and disparities of quality of living in San Francisco that can be very very very profound. But then I’d say that is probably just the U.S., in the U.S. in general. You have a sort of much greater extremes compared to what you’d probably find in London. Suz: Let’s go back to the very beginning again. You co-founded your company with your childhood friend with Martyn. Did you meet at school? Srin: No. So we met at a conference for people with the same disability. Martin and I both have a condition called spinal muscular atrophy which essentially means that we have very little movement of our arms and legs. So effectively we’re kind of like for want of a better phrase a pretty sort of physically paralyzed in our arms and legs. And there was this conference for kids with the same disability and we just hung out there basically. We met when we were little children and got on really well and we’ve been friends ever since. Suz: You studied at Oxford, so you must be very clever. Were you a good student growing up? Srin: It depends. It came down to things that I enjoyed doing it. I probably could procrastinate pretty badly afer the subject if I didn’t enjoy. And probably needed a bit of a kick up a bum whenever needed. But if it was something that I really enjoyed you’d get really kind of fired up about and really engaged with. I would pull my heart and soul into it. And I would get good grades but I think the key was that teachers had to make sure I was motivated. I probably wasn’t the most…I could be a bit of an awkward student sometimes if I was distracted. Suz: Which subjects did you enjoy the most? Srin: It would be more the science the maths type subjects. Those are always the areas that I had a more natural kind of tendency to enjoy and be better at. I probably would have been more on that side of things at school or anything involving the things like art or being more creative or design – probably not my best areas. Suz: Today you are a coder and a lawyer and an entrepreneur. Who did you dream of becoming when you were in your teens? Srin: I don’t think I really had any (ideas). I was more of just not knowing what was out there and it was just like chasing things that I enjoy and doing things I like without really any kind of bigger picture of where I wanted it to go. You know growing up as a teenager as well with the level of disability that I have. A lot of it was also not really knowing what was what was available to me in the sense that not really knowing what kind of help I would need at work. What kinds of adaptations and accommodations I would need in the workplace so there were so many unknown questions out there that I didn’t really have a big concrete vision of what I wanted to head towards. So my career ended up being more a case of following the breadcrumbs, really doing what I find interesting and just keeping all options open and seeing where it took me. Suz: Would you say that you’re an accidental entrepreneur? How did it happen? Srin: So to answer that question I probably should track back in terms of my slightly mixed and varied background. So I started off as an undergraduate as a genetic scientist. Thinking that I might do something more in the world of like science and molecular biology or maybe medicine but finding that OK that wasn’t for me. And then I retrained as a lawyer in the city again thinking that oh you know I had a science degree so maybe I do sort of IP law. When I started working as a lawyer I found myself really enjoying more the corporate side of things working in the M&A world, and ended up qualifying as a as a corporate lawyer. However while I was doing that on the side I’d always have a lot of side projects and there’s always had a love for making things, building things, running little newsletters or helping friends get things up and running. So rather than sort of The Accidental Entrepreneur it was more maybe starting Accomable was a bit of an accident. But I’d always have loved it just like making and building things and trying stuff out in my spare time. And just dealing with it and seeing what happens. I took a decision to leave the law to see what more entrepreneurial opportunities could be out there and that took me into doing the MBA at Oxford. And while I was at Oxford that’s when I started to learn to code. So I was very fortunate to get to know some really talented computer scientists when I was there. And they started teaching me how to code and I picked a few things up from them. By the time I graduated two years later I was doing freelance web development for people. Accomable effectively started as a bit of a fun side project to improve my own coding skills, it’s an area that I’m really passionate about. And so me and Martin were just going to brainstorming ideas what can we do to help people with disabilities travel. It just ended up being like ‘Yeah let’s just have a go at building something and see what happens’. While Accomable was an accidental startup just to solve a problem that me and Martyn found interesting, I’ve been the entrepreneurial track for a while now. Suz: You said that Accomable started as a side project. But when you created the website and you saw the potential. Did you think what it can ultimately achieve? Did you think this is something that can be bigger? And you had hopes and dreams for it? Srin: We had some vague ideas. But when you’re just starting and you just have a very basic website together it’s difficult to see the big picture. At the beginning purely because there’s so many unknown things. When we first made it I had no idea whether anybody would even like it, would they find it useful. I knew I would find it useful. I knew my family would have found it useful and booking travel when I was a kid. But you have no real idea what exactly people are going to think until you try it. I think the vision and the bigger opportunity only really started to become clear when we saw the excitement that people had when they were engaging with the product. And that’s when the imagination starts to run wild. ‘Wow’, we could really make a difference to so many people. But at the beginning it was more like here’s a very very specific problem, can we build something to fix it. Suz: Can you tell us a little bit about how the website worked when you guys started it and how it evolved? Srin: Yeah sure. So when you travel with a disability or any kind of mobility (issue) or a problem whether it’d be because of a disability or because you’re a senior citizen or old age, there’s an entire spectrum of reasons as to why people would engage with Accomable. But effectively when you travel with some kind of disability, it comes down to two sort of key things. One is finding the specific adaptations that you need. As in, is there a roll-in shower, grab rails? Are there bits of medical equipment that you need? And the second thing is being able to trust that the information that is being shown to you is accurate. So one of the major problems that faces a lot of people with disabilities is inaccurate information. On most platforms or websites the majority of people with disabilities always heavily discount the information they see because it’s generally accepted that that information is most likely to be wrong and unvetted, and unchecked. Created by people who may not have a deep understanding of what people need when they are looking at accessibility information. So those are the two key things that we focused on. We made listings really granular. You could search for so many different things. And we always added a layer of verification where either me or a person in the team would work with the property owner to make sure that every single bit of information they shared on the listing had photos and videos to back it up. Suz: As you were developing the website and it was growing, what were the biggest obstacles that you encountered? Srin: Oh gosh you’d have major obstacles. It felt like every day everything, from building, just making a website work and be useful for people. And being able to quickly integrate feedback you’re getting from users so you can iterate the product quickly, to raising money to hire people and then trying to scale and then trying to build out all of the new like backend operations and customer service operations, building infrastructure and all of that. You know what you’re trying to build out when there’s so much volatility going on and you know startups are such inherently fragile and unstable creatures you’re having to build so much with very little resources in a very short space of time. I mean all of that just collectively creates this one huge challenge and I’m sure as you’ve seen from your experience in the startup world as well. Suz: Yet you have succeeded. So do you have a tip for people who are starting out right now? And how can they get over all these obstacles when they’re really really struggling. Any words of wisdom? Srin: I think again some people will probably disagree with this. I think if you asked 20 different people for their advice on startups and you’ll probably get 20 very different answers. What I say to entrepreneurs at the very beginning stage is: start small and think about the very specific problem you are solving. I think a lot of entrepreneurs get really ahead of themselves and think about the big picture, the big market opportunity even before they’ve even solved a single problem. My advice to a lot of entrepreneurs in those very early days is just try to be as focused as possible on one very specific thing. And then if you find you are solving that problem for people, use that as the base to then expand and create a bigger picture of where the product could go. Suz: And when you started out, how did you market the company? How did you market the website? Srin: I think that’s the beauty of a product that is serving an untapped need. We never actually spent a penny on marketing. All of our customer traffic from day one just came through word of mouth, me posting on social media, emailing friends, contacting folks in the community. We often found that our best driver for customer acquisition would be people making a booking with us and then sharing it on Facebook with all of their friends about what a great experience they had using Accomable. And that in turn it just used to drive more traffic. So I think that was always the thing for us because we were solving a very specific need that people had. And it was a need that everybody else was just egregiously ignoring. The minute you do serve that need, that in itself sells itself. Suz: When you built the website, did you think about the business model for it? How you’re going to monetize all the traffic or was this something on a back burner? Srin: We had some vague ideas, but again I’m always a big subscriber of that experimenta hypothesis driven way of building products. We had a bunch of ideas ranging from transaction or booking fees or could we have subscription and could we be advertising. We had loads of different ideas and where we ended up landing on was that the best way to monetize the platform would be sort of the Airbnb/Expedia style of taking booking fees per transaction. Suz: Was the company bootstrapped? When you guys started, did you get any funding. Srin: Yeah we had a bit. Early on in the project we won a pitching competition. So the School Center for Social Enterprise at Oxford University were running a pitching competition for companies that were both for profit but could also have social impact. So we won a grant from that and then about six to seven months in we raised a round of funding from a bunch of angel investors. Suz: How did you build your team? I don’t know how big the team was when you guys got acquired but I’m guessing there were a few people working with. Srin: We were a team of eight in the early days. The vast bulk of our team came from my network whether it’d be people I had worked with in the past or people who had started volunteering. Quite a lot of early hires just found what we did really interesting, just wanted to get involved. And saw me just being overloaded and before we had any funding it was just folks saying you know ‘hey let me let me just get involved doing something really interesting’, ‘I’ve got a bit of spare time let’s just see what happens’. A lot of that just evolved into people being taken on as full time hires when we actually raised some money. Suz: What would you say was your biggest win prior to the acquisition? Srin: I think there were just lots and lots of little wins. Where there may be getting our first groups of customers or building our payment system or where we were starting to get some really, over the moon delighted users that were really thrilled about the service that they had. Or some other major highlights we had a couple of celebrities in the Paraolympic sports world using our product and writing a really great review of us in the Sunday Times. We just had lots of wins that I always framed the win in the sense that ‘are we delivering something really good to the customers’. We had the wins that were primarily around ‘are we doing an awesome service for people’. Suz: It sounds like a very rewarding journey. Is there anything that you would have changed? Srin: I think hindsight there’s always things we could have done better, we could have done a little differently. It was an incredibly rewarding and fruitful experience in terms of what I learned and all of the things that we took from the experience I wouldn’t change. I Think naturally any founder will tell, you always go through a startup experience with lots and lots of scars on your back. There were things we’ve done wrong, there were things that we could have done better. And you know startups are the most incredibly stressful thing that anyone could ever do. So when you are trying to build a company with no real resources and in a very difficult new and novel area the challenges are endless. And they are all consuming and you spend week after week after month after month after year barely ever getting any sleep. It’s always a mixed bag right feel on the whole, I will always look back at it as one of the most incredible experiences ever. Suz: Well let’s talk about the Airbnb acquisition. When I was doing a little bit research about Accomable, I read this article and it was in San Francisco Chronicle about your company back in September 2017 and in November you guys got acquired by Airbnb. And I’m wondering did Airbnb read the same article or how did they come about? Srin: They kind of knew us a little bit before that article in the summer of 2017. We started our Series A funding round. We’ve been growing really fast, but we were buckling under the pressure and the strain of that growth in terms of needing investment in our infrastructure. Being able to build all of our support structures in place for customers so we were in the need of some serious capital. And a bunch of folks who were advising us suggested chatting to some of the major attack tech platforms out there because a lot of that infrastructure they have already built and seeing whether there could be any opportunity to partner or invest or explore, whatever possibilities could come to mind. So one of Accomable’s investors made an introduction to somebody at Airbnb. Those conversations started off very exploratory of how could we scale the very unique and impactful expertise that we had. And those conversations then moved to ‘we think the best way to working together would be a full acquisition.’. Srin: You’ve been with Airbnb for a few months now, is there anything you can tell us about the roadmap that will make the experience better for people who are using Airbnb. Suz: Yeah sure. I moved to America in January and started roughly around then. In that time we have launched 27 new guest filters for people to search for properties on a much more granular basis. The long term roadmap is still getting kind of concreted at the moment. A lot of our work the last month, the last few months has been more about integration, bringing Accomable’s properties onto Airbnb. But going forward there’ll be a mixture of things. How can we improve the products now that we can work within the larger platform that is Airbnb. There’s probably a whole host of new product features that we would try, that we would look to try out. And secondly it’s trying to make sure that we have sufficient supply and trying to reach out to more people around the world, and trying to help them understand if they do have a home with accessibility features Making sure that we can facilitate them to list. Another area that I’m really passionate about is actually how can we get more people with disabilities to actually host on the platform as well, and generate an income. My hypothesis is that a lot of people with disabilities will have really good accessible homes. How can we reach out to the community to be more engaged with Airbnb and to host their homes as well. Suz: That sounds really exciting! You’ve been a part of a larger company since January. How does this compare to building your own company? What do you miss, what you don’t miss. Srin: There are just some things that are very different and understandably different. So when you are working at a large company, it’s not the way that things work at a startup where you know you decide what you want to build on a Monday, ship it out on a Tuesday then iterate on it on Wednesday. That agility and speed that you have at a startup is not there in the same way at a larger platform. Like I’d say Airbnb is much more innovative and moves so much faster compared maybe to an average large organization as you’ve seen with the growth of the platform. But equally when you are building product where you have tens of millions of users there already, you do have to be so much more thoughtful and methodical about how you build things, and making sure that you have buy in from other people within the company to make you’re aware and cautious of what you’re building and the impact it has on other parts of the platform and on the community. So that would be the main difference. Anything we now design and create, and ship has to be done in a much more measured, thoughtful way over a slightly longer timeframe. Suz: You moved here and started working pretty much straight away. Did you have any time to travel across the U.S. at all in the last few months? Srin: No, not in the last few months much. I’ve been to the U.S. many times before as I have seen a lot of America. But since I got here probably the only real trip that we made was outside of the Bay Area. Me and Vicky, my girlfriend who came across with me, we both went to Lake Tahoe and tried out skiing for a weekend. Suz: Would the U.S. is more accessible for people who have disabilities or Europe is? Srin: It’s different. On some things I would say America is better. Some things I would say Europe is much better. So in terms of building accessibility, America is just light years ahead. I still don’t think I’ve come across a restaurant or a bar or wherever that has not had access. So is more day to day like leisure amenities and facilities do just have like accessibility baked from the beginning. I think that just comes from the fact that things are just newer here. I think where you find the biggest struggles are more about the service side of things. So transport and taxis or finding support for care and health care and all of those may be more infrastructure types of services that may be are more the preserve of the state back in Europe, or the welfare state back in Europe are just pretty nonexistent. So for instance in San Francisco one of my biggest bugbears has been a complete lack of like accessible taxis. So while public transport doesn’t have the best of coverage, it’s been nearly impossible to find taxis or vehicles that have ramps whereas back home those sort of things are much easier to find. Suz: And I guess we were facing the same problem Ubers and Lyfts. Because these cars obviously are not necessarily accessible. I’ve read that you travel a lot. And that your favorite trip was to Korea for the Olympics. But I’m curious what is your second and third trip that you made? Srin: Oh I made so many it’s difficult to remember them now. Back in 2011, it was pretty much my first time traveling. I went to South Africa and did a camping safari out there which was pretty incredible. I went diving out in Bali. There’s a special adaptive diving centre out there and I went on a dive in Bali is pretty incredible. So many amazing things in the world and so many amazing trips that can be done. There has been a lot of interesting places that I’ve enjoyed going to. Srin: I tried skiing with a very amazing adaptive skiing organization, a non-profit down in the Lake Tahoe regions. I’ve tried out the skiing but I probably would not want to call myself a skier or imply that I have any expertise in that area. I’m just curious. Suz: Is there anything that you are really really bad at because you’ve got so many careers and you’re trying so many different things? Srin: Skiing. Based on my skiing trip. I still have a lot to improve on the adaptive skis that I sat on. I needed a lot of help to keep those in the right direction. I probably could become a lot better at that. But everything everything you do can always be better. Suz: I’m having problems getting motivated a lot, especially when the weather is not great. It’s gray outside or it’s smoggy outside because I’m based in Los Angeles and it happens here actually quite a lot. And I’m wondering what would you say to people who lack motivation, it’s hard for them to get out of bed. But they have to build their businesses and they have to persevere. Srin: I think it comes down, in my view, again as we will another one of those questions we get 20 different answers from 20 different people, that it comes down to working on things you care about. I really enjoy working on products where the everyday person might benefit or we can offer something better to the everyday person or we can make their lives a little bit easier or better. And you’re trying to work with underserved communities that have not been able to benefit from other major technology products out there. I find that just doing something that can actually make people’s lives better is a real driver and motivator for me. And sort of what keeps me going. And that is something I tell a lot of other entrepreneurs if they go for the next big market could be, it’s going for things that they can actually really care about and trying to help people that they really care about. And if you don’t really care about building a B2B SaaS product for investment banks, it’s going to be really hard then to care about it when things get tough right. Whereas what we did, instead of working in the more consumer area, you are building something where you felt the everyday person is benefiting from it. That is something that is a really powerful driver to get you out and up and running in the morning when you are just like having those days like everything is going wrong. Suz: Thank you! That helps a lot, it really really does. You are a member of GBX which is a community of British entrepreneurs and senior execs who moved from the UK to the Bay Area. I’m curious, how did you find out about that community? Srin: I found out about it from another entrepreneur who made the move from the UK to the Bay Area a few years ago whom I met at a networking event back in January for alumni at Oxford. And he just said check out GBX they organize a bunch of great events and if you’re new to the U.S. and to the Bay Area, it’s a great way of getting to know people working in a similar area and working on interesting things so check them out and join if you can and I did and I’m here. Suz: And what do you find most useful about it? Is It the events, what types of types of events? Srin: It’s a mix of things. I think one it’s the community aspect of it and just getting to know people working on interesting things who have also moved over to the Bay Area. It’s also interesting and useful to get people as sort of support and help for your arrival like myself that I found really good. And I also just get really motivated and I really enjoyed just hearing what people are working on in the GBx. Everybody I’ve met is doing something really interesting and some things they seem to really care about. That in itself has been very enjoyable to learn more about. And then I feel that I can also give a lot to the community as well in terms of just having gone through. Everything from trying to build a company, get it up and raising money and exit. I want to make sure that I share my experience with other Brits in the Bay Area as well. They may be going through similar events in the lifecycle of their company. Suz: That’s great. Now we know who to send them to. Srin: And in turn the only reason I got here was because so many people supported me, and a lot of times there was no obvious benefit for supporting me, they just wanted to help me. I’m very keen to make sure that I can pay it forward. Where so many people helped me pure kindness and generosity, I want to make sure that I can like help others. Suz: Great. I hope to see you at the Gala. Srin: Indeed I’ll be there. Suz: Srin, thank you so much for your time. What an amazing story, a massive British success truly.I really enjoyed talking to you. I want to thank you so much and hope to see you soon. Srin: Indeed. Thank you so much.